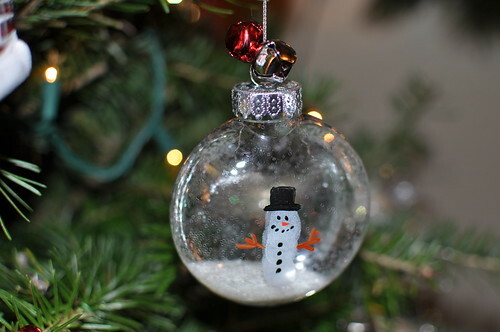 For Christmas this year, he and I made ornaments for his grandmas and aunts and uncles. These were very simple to make. 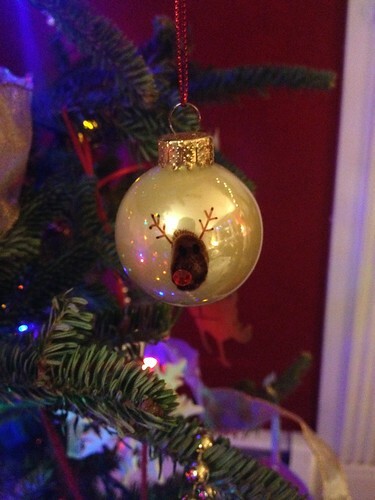 The ornaments are clear, hollow plastic...discs, I guess? (they're flattened, rather than being spherical). 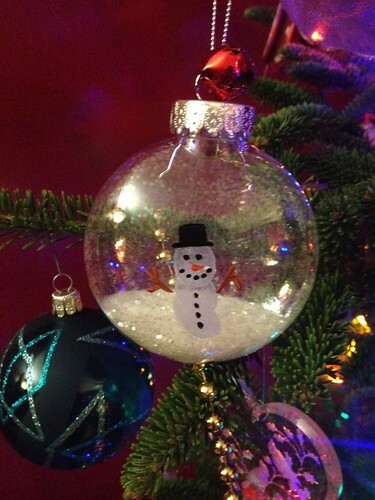 Using a white Stazon inkpad (a solvent ink that adheres to non-porous surfaces like glass and plastic), Ian stamped his thumbprint three times to make the snowman. After the ink dried, we used acrylic paint to add the snowman's face, hat, buttons, and arms -- I painted, Ian supervised. When THAT was dry, Ian partially filled the ornaments with coarse glitter (added bonus: thanks to the magic of static electricity, some of the glitter stuck to the inside of the ornament, making the whole thing sparkly!). Then we put the tops back on the ornaments and put on the strings. Ian had the idea to add a jingle bell or two, so he strung those on as well. Ian helped a lot less with these -- he was much smaller! ;-) These are small glass balls with, again, Ian's thumbprint (this time with dark brown Stazon). I glued on a little red rhinestone and drew eyes with a black Sharpie and antlers with a brown Sharpie. Voila: reindeer! I'm a total sucker for kids' crafts incorporating thumbprints and handprints -- by the time Ian ages out of wanting to make silly little Christmas ornaments with me, we might have quite the collection of them! I haven't had a whole lot of opportunity yet to play with it, but I think that shrink plastic is my new favorite thing. I always loved Shrinky Dinks when I was a kid, and revisiting the stuff as an adult -- and with the knowledge that I can make MY OWN DESIGNS -- has been a ton of fun so far. Some time ago, I started noodling around an idea for a Doctor Who-themed jewelry project, and finally got the chance to try it out back before Christmas. 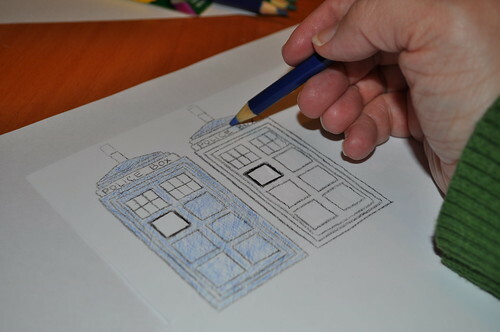 I started by finding a simplified line drawing of the TARDIS and tracing it onto translucent white shrink plastic sheets. I used regular old Crayola colored pencils for both the outlining and the coloring. The shrink plastic has a smooth surface, so I had to rough it up with some fine-grit sandpaper in order for the pencil to "stick." I had printed the source image in several different sizes, since I wasn't exactly sure how much the plastic would shrink, but as it turned out the first one I tried ended up being about the size I'd hoped the finished product to be. 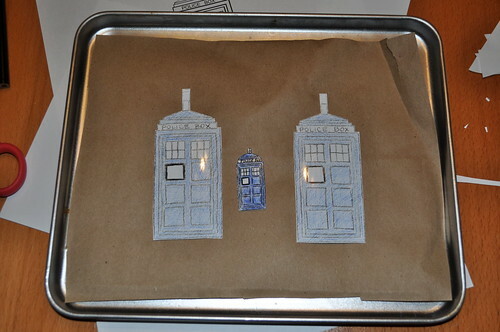 After cutting them out, next up came the shrinking, which I did in the toaster oven on a baking sheet lined with brown paper. Have you ever made a Shrinky Dink? It's such fun to watch -- the plastic jumps around and curls up as it contorts into its final size and shape. Mine were pretty flat when they finished, but sometimes they are left with a slight curl and you have to quickly flatten them with something when they are still hot and pliable. Look how much they shrink! The color also intensifies as the plastic shrinks, so you have to be careful not to saturate your colors too much lest they become too dark in the finished product. I had to do several batches, experimenting with the placement of the hole (I was planning to turn these into pendants and earrings, so I needed a hole to attach a jump ring, and it's much easier to punch the hole before shrinking). I also discovered that the plastic doesn't shrink equally in both dimensions -- I traced several TARDISes with the plastic in portrait orientation and several in landscape, and the ones that were done in landscape ended up being shorter and squatter. You can kind of see the difference in the picture below, although it's easier to see in person -- in the grouping of three, see how the middle one with the earring finding is a little taller and thinner than the other two? Interestingly, the portrait-oriented ones also cooled flatter -- the landscape ones were a little more wavy. 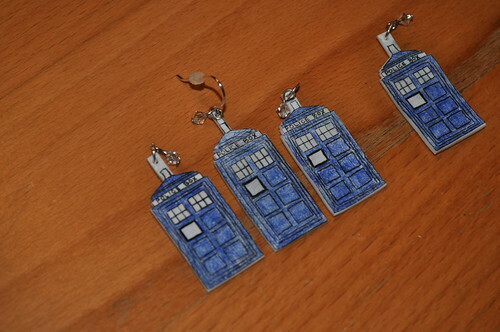 I finished these into simple pendants and earrings -- in the bead aisle at Michaels I found some little faceted crystals that were pre-hung on a wire loop, and attached those to the top with a jump ring to look kind of like the light atop the TARDIS. For the earrings, I then attached the whole thing to an ear wire. Given the shrink plastic medium, I think it's fair to say that these are bigger on the inside, no?